There will be a posting after this one goes out. When? I can’t say. But, the next blog Travels 27.2 will be a concise explanation for why 27.1 is necessary. It will reveal in bone-chilling, spine-tingling and shocking details, the series of wrong moves made by me, the so-called Captain, as we arrived at our home on or about 7:30 pm, Friday last. I mean, why was I expected to remember that I had two bikes mounted atop the car when I attempted to pull it into the garage? Give me a break! I had enough stuff on my mind, like getting into the house and getting Travels 27 out to my expectant fans. Families had put off weddings and Bar mitzvahs to gather around the laptop and read the closing chapter. Bowling tournaments were cancelled. High school football games all across America extended half-time. Homecomings were delayed. Guys doing some heavy making out behind the Grand Stand of the Owego Fair Grounds, stopped the biological urge and pulled out their Mini (iPad). Internet cafes had extended their hours to allow the blog readers to drink more Mocha and Latte in anticipation of #27. 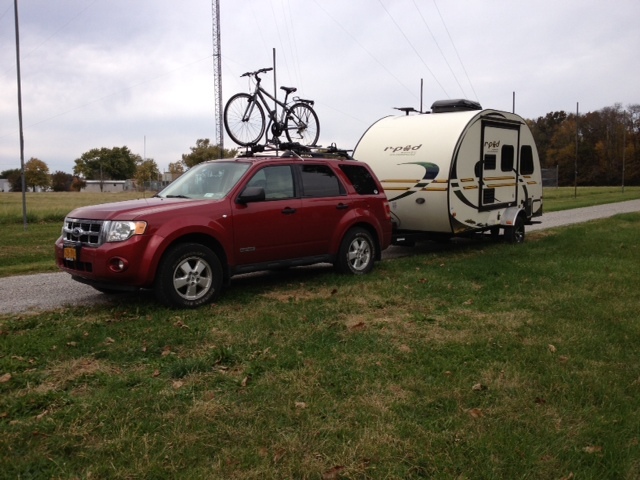 This entry was posted in The RV Life, Travels and tagged campsites, Grand Canyon, internet, mpg, national parks, travels. LOL. You do realize you now qualify for a lifetime National Park Pass for $50 right??? Seriously!